13.5" x 8" x 10.5"
Ngaady a Mwaash, the sister and wife of Mukenga, represents all women in the Bushong creation myth. 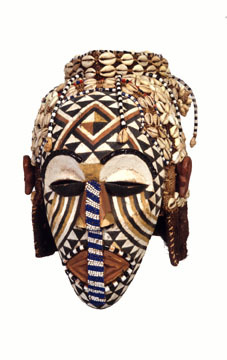 Bark cloth, covering the back of the mask, is a form of ancestral clothing. Participating in male initiation ceremonies with Mukenga and Bwoom, Ngaady a Mwaash is played by a male who imitates female bearing. The mask's complex patterning of lines (tears) and triangles (hearthstone) attests to the hardships of birth and death as well as the domestic role of women within the culture. The Mukenga, Bwoom and Ngaady a Mwaash masks in the collection are unusual in that they seem to be constructed of both new and old elements. The tuft of raffia on the end of Mukenga's trunk appears new. Typically, red feathers appear in this spot. The cowry shells on all three works show signs of repairs (old and new) and differ in their degree of wear. Bibliography: Cornet, 1978, p.198; Freyer, 2002; Hahner-Herzog, 1998, pl.82; Woodward, 2002.